Chris Hardwick is the hardest working nerd in show business. Besides founding the Nerdist podcast as well as Nerdist Industries he has hosted shows on the BBC and the Talking Dead show on AMC that runs after the Walking Dead. He is addicted to everything nerdy and I'm pretty sure he runs on wi-fi at this point. That's why, when I heard he was going to be hosting a game show about the internet, I knew I had to watch. I'm glad I did, it is AMAZING. @Midnight is a late night game show that is on Monday through Thursday after The Colbert Report on Comedy Central. It is bewilderingly awesome. Just brilliant. It's a game made by internet addicts for internet addicts and curated by a cast of comedians. Chris Hardwick hosts the show with all the sprightly energy and joy of a hobbit who's about to go on a magical adventure. He looks genuinely thrilled to be there every night and you can tell he takes great joy in it. The comedians come from all walks of comedy, from established stand up comedians and actors to rising stars from YouTube. So what makes @Midnight so awesome? Well, if you're anything like me, you spend an obscene chunk of your time on the internet in some form. Whether you're gleefully cackling over drama on Twitter or catching up on gossip on Gawker, you know the hot internet stories of the day. Hardwick mines all of that for a half hour of jokes at the expense of the internet. He digs through the depths of reddit and etsy for things to mock and creates categories based on Yelp reviews and Vines. If it happened on the internet that day, @Midnight is mocking it. Thankfully, nothing feels mean or cheap about the show. 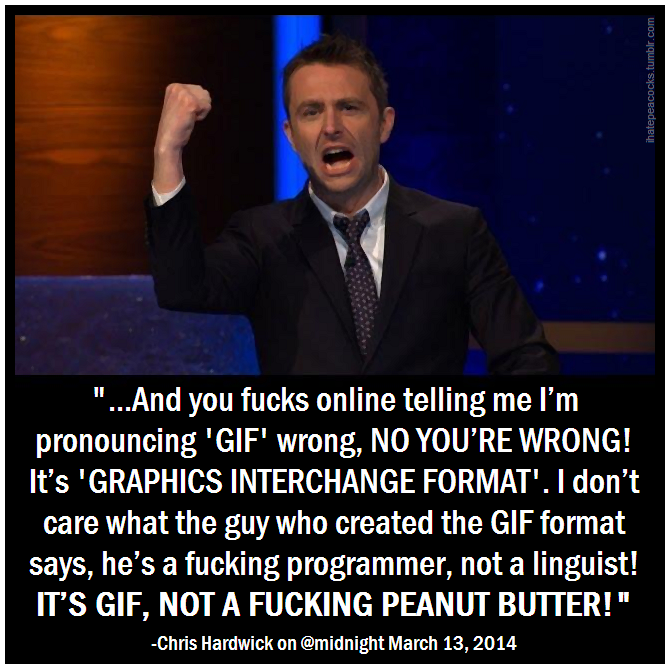 Hardwick and the @Midnight writers are all citizens of the interwebs and they mock it lovingly. It never feels cheesy or forced because they embrace and understand the internet. The format of @Midnight is exceedingly simple. Hardwick acts as moderator, shouting out his new trademark phrase "POINTS!" when one of the three comedians playing make a funny answer. The categories are things like the popular reddit game "Cringeworthy" where comedians use just three words to make Hardwick cringe. There are live challenges that involve the comedians writing fake Amazon reviews and responding to Craigslist ads. There are games that involve telling the difference between Yelp reviews for Chucky Cheese and prisons, as well as showing gifs and asking the comedians to guess what happens next. Each segment is topical for the day and often involves gossip, tech news and geeky things like Doctor Who and Game of Thrones. The game that ends every episode is suitably called "For The Win". The highlight of the show is a segment called Hashtag Wars, where comedians come up with as many insane things to fit into a Twitter hashtag as possible. If you're ever on Twitter around 11:30pm EST you have undoubtedly seen a flood of people tweeting bizarre answers to things such as #RuinAChildrensBook, #StaycationSloguns, #DrunkMovies and #BadBroadway. Part of the charm of @Midnight is that the Hashtag Wars game is just basically giant audience participation. The best tweet earns the coveted spot as the Tweet of the Day on the next episode and the incredibly engaging and funny @Midnight Twitter account hands out POINTS! to some of the best answers. Honestly, does Twitter love anything as much as it loves a good hashtag game? 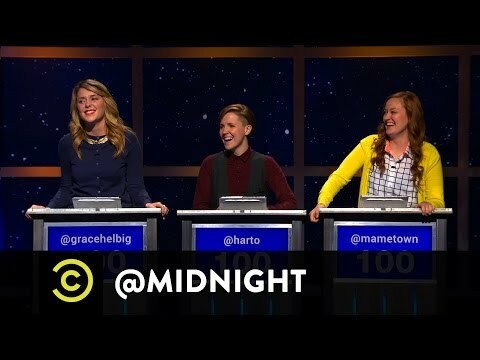 Besides the fantastically fun audience participation and the great work by Hardwick, @Midnight is notably for it's inclusion of female comedians. Teams of just men are few and there's usually at least one female comedian on every panel. They're allowed to shine and no one talks down to them for being women trying to be funny. Seeing funny women included is an absolute joy. Nothing about the female comedians feels like a token gesture and many come back for additional episodes. @Midnight is the funniest program on TV right now. Almost every episode makes me laugh so hard that I cry and POINTS! has become part of my internal brain monologue. If you aren't watching this, then there is something very wrong with you.